I am a child of the Space Race. The heroes of my early youth (aside from Walt Disney and JFK) were the astronauts of the Mercury, Gemini, and Apollo missions. Without fail, I would sit down in front of our little black-and-white television to watch every launch, every splashdown. It never got old, especially during the “seven minutes of terror” during re-entry. I read every article I could find about the programs. I assembled scale models of the boosters and capsules. I used words like “gantry” and “gimbal,” and could instruct adults on the meanings of pitch, roll, yaw, and skew. As the decade progressed, the space race gave me something to focus on, something other than missile crises, assassinations, Cold War saber-rattling, and duck-and-cover exercises. I cheered with each liftoff and exulted at each return. Apollo 11 was different. 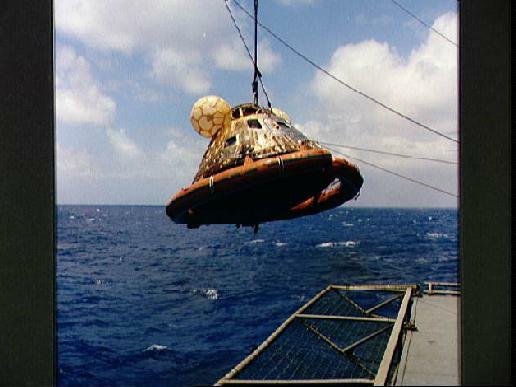 Apollo 11 was much more than a liftoff and return. It was a culmination of years of rapt attention. The prospect of a lunar landing would have been enough, but a man on the moon? A man walking on that virginal orb, that silvery fingernail lunette, that icon of the feminine, ever-constant yet ever-changing, both young and ancient at the same time? It filled me with wonder, amazement, anxiety, and the absolute knowledge that, if it happened, if tragedy stayed its hand and we succeeded, the world would never be the same. Then, on July 21, 1969, Neil and Buzz stepped out on the grey dust of the Sea of Tranquility, and the world looked up in awe. That year, for my birthday I was given the Revell 1/96 scale Apollo 11 Columbia and Eagle kit, which came with a bit of gold-colored foil to wrap around the base of the LEM, and it was the coolest thing ever. I did not approach this build with my usual pubescent fervor. Oh, no. This kit I assembled like a surgeon, removing parts from their runners with X-Acto precision, shaving flash and sprue from the delicate pieces, applying glue with a sparing hand, and affixing the fragile decals of flag and “UNITED STATES” with a steadiness acquired during years of model-building. The Columbia and the Eagle hung from my bedroom ceiling, a place of honor where, at night, the LEM’s gold foil glinted in the light from the moon their namesakes had visited. Over time, they were joined by the Orion and Moebius (2001: A Space Odyssey), the Hawk (Space: 1999), X-Wings and TIE fighters (do I really need to tell you where they’re from?) until, dusty and cobwebbed, I finally gave them to my kid brothers to enjoy. With this as prologue, you can imagine my squee-ful reaction when I learned that I could actually own a piece of Apollo history. It took a nanosecond to make the decision. The item is not impressive. It’s not a moon rock or a dial or a vintage mission patch. But it is special to me. Pictured above, encased in a Lucite box, it is a tiny square of the kapton thermal protection blanket that covered Columbia, the Apollo 11 command module. This little square has been to the moon and back. Half a million miles. Pretty damned amazing. And it makes me very, very happy.